Looky that! 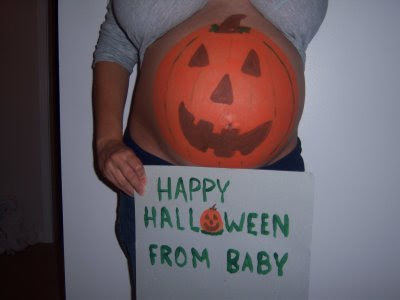 That is the best pumpkin I have see this Halloween! And just who is responsible for that fancy paint work??? I think that is THE CUTEST thing I have ever seen!!! I can't wait til I have a belly like that and can do that. . . how did you ever think of that??? SO CUTE! Oh my gosh, that is pretty awesome. It looks so cute! Great painting job! 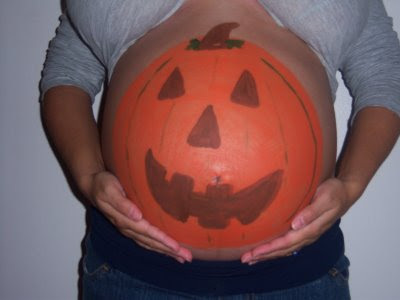 I wanted to do that when I was preggers but was too tired. I did carve punkins, tho. Thanks for sharing!! Just too darn cute! Happy Halloween! At least you've got the good reason for being able to use that costume. I'm hoping mine will never be quite so impressive. Happy Halloween! You do have the CUTEST pregnant belly! OOOO I LOVE LOVE that YOU did this! ARE you casting your belly also...MY sis in Law had it done....it was way cool! That is completely awesome!!! I love it! And so clever. Your husband rocks for painting that! Love it!!!!! Lookin' good Baby! !